Hospital Furniture is the most important part of its infrastructure and environment. It is very important to have good quality furniture for the comforts of patients while their stay at hospitals. Doctors also find ease while treatment with a good quality and technology driven furniture. Lockers and cabinets are used by staff and doctors to put things and lock their belongings while being at hospital. Some bedside lockers are used to put medical items which are generally used while treatment. 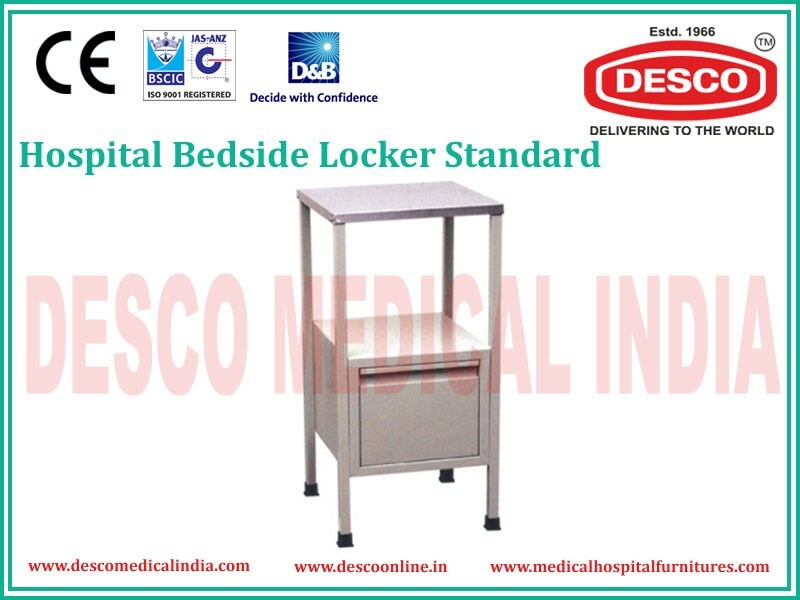 DESCO India is a manufacturer of Hospital Furniture at wholesale rates. We manufacture bedside lockers with modern technology and most efficient storage system. We provide many options for designing products and our product quality is certified for delivering best services. There are many options for Bedside lockers as we provide five types of bedside lockers. Manufactured with stainless steel top, it is designed with one box for storage. It has one locker with cupboard design for storage option. Whole locker is mounted on static rubber shoes and whole structure is manufactured with square pipe. Drawer Bedside locker is manufactured with stainless steel cube pipe and SS top. It has edges extended upwards and has a drawer locker for storage. Deluxe Bedside Locker is made up of mild steel top and mounted on castors for easy mobility. It has one cupboard locker and one drawer for storage purpose. It is closed from three ends. Made up of ABS Plastic, it is mounted on plastic castors. It comes up with a cupboard and a drawer for storage purpose. With Wooden framework, this is designed with a cupboard and a drawer for easy storage. It is mounted on castors for easy movement. We are the fastest growing industry since our inception. Our aim is to provide you good quality furniture for your hospital or clinic. If you want any kind of furniture for your hospital than DESCO India is the best manufacturer and supplier of Hospital Furniture.